Soccer moms can be stylish too! Jeans and a tank- no effort outfit. It’s officially fall, or at least the beginning of soccer season! Today is my daughter’s first game, luckily it looks like it will be another beautiful and warm day. Since I’m going to be outside trudging around a dusty, dirty park I need to go very casual today. Ideally I’d wear a pair of boyfriend slouchy jeans- but since that’s on my shopping list, I’m making do with what I have. 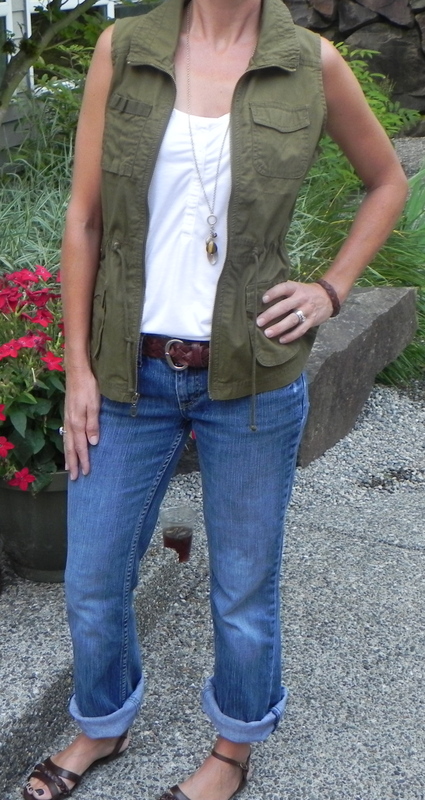 These jeans are from Banana Republic, and they are one of my favorite weekend pairs. I like the light blue wash and I love the way they fit- especially that they come up high enough around the waist that there is no crack peeking out! Personally, that is about the ugliest thing to catch an accidental glimpse of! In the picture on the right- I’m wearing them as normal. They look a little blah. On the left, I have rolled the cuffs to add a little style to my look. On the right I just have on a simple white tank- untucked and un-accessorized. To top it off, I’m wearing my Birkenstocks again. This look screams- I don’t care what I look like! On the left I have re-styled this same concept. I rolled the jeans up a bit to add some style. I partially tucked in the tank, added a cute braided belt and braided bracelet (it’s hard to see, it was my hubby’s in college and I think it’s so cool!). 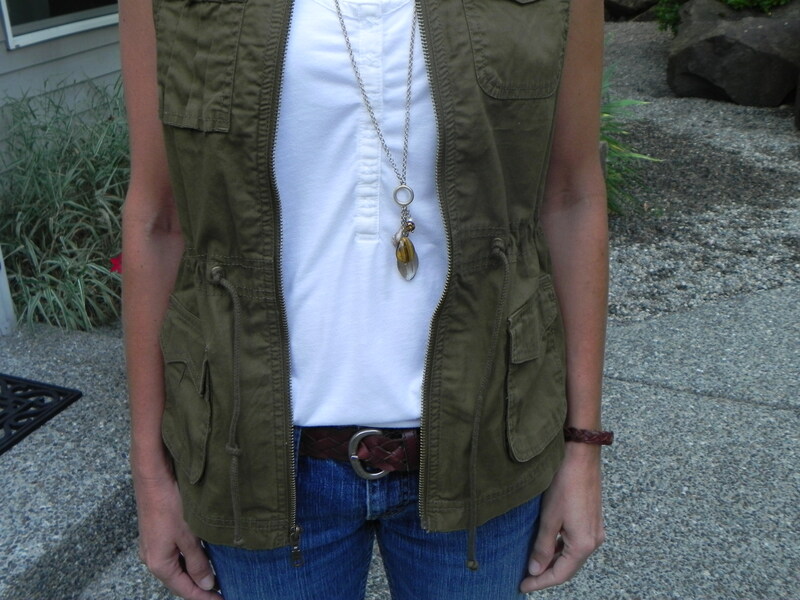 Inspired by the cute military vest style that is popping up everywhere (see my More Everyday Mom’s page)- I threw on my vest to add a little style and warmth. I also added a long necklace with a pendant and some cute brown sandals that I scooped up off the clearance rack at Kohl’s for $10- originally $40. What a deal!! To see this vest on another fashion blog- click here! Re-styled with belt, necklace, vest and better shoes. I love the small details on this tank. The buttons down the front add visual interest.